Imagining the world of George Orwell in the times of surveillance. 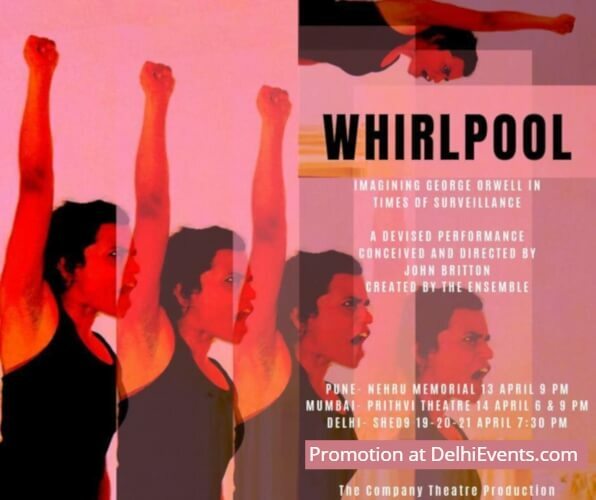 Inspired by George Orwell’s life and novels, especially 1984, Homage to Catalonia and Animal Farm, Whirpool is a devised piece with an emphasis on ensemble work. It explores how to live in the age of internet-of-things and social media surveillance. Colliding Orwell’s work with our contemporary realities, the play looks at how power-dynamics shape and create our peculiar cultural vocabulary. ‘Whirlpool’ starts from the life of Indian-born British writer George Orwell, though the scope of the production moves well beyond biography. The aesthetic is radical, physical, confrontational, playful and experimental. It explores the dystopian visions of Orwell and his imagination - how Orwell’s visions are being brutally realised in contemporary Indian and global politics - not only through drawing parallels with contemporary events, but examining how today’s politics has moved beyond Orwell’s visions, as technology and Artificial Intelligence expand their potential and reach. constantly what the audience has come to believe as the ‘reality’ of the piece will be subverted. The ultimate questions will concern who is controlling who, and how.